Verbatim M DISC optical media is the new standard for digital archival storage. Unlike traditional optical media, which utilize dyes that can break down over time, data stored on an M DISC is engraved on a patented inorganic write layer - it will not fade or deteriorate. This unique engraving process renders these archival grade discs practically impervious to environmental exposure, including light, temperature and humidity. ISO/IEC 16963 standard longevity tests have proven the durability of M DISC technology, and it withstood rigorous testing by the US Department of Defense. Based on ISO/IEC 16963 testing, M DISC media has a projected lifetime of several hundred years. 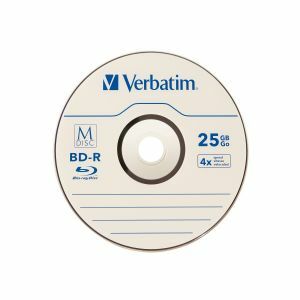 Designed for widely distributed large data such as scientific images, video, and other commercial application object data, Verbatim M DISC BD-R media have a storage capacity of 25GB - allowing you to use fewer discs while archiving your files.